Schützen Sie Ihren Körper, besonders bei schnellen Abfahrten im Winter mit der Element Windstopper Active Shell Weste von Gore Bike Wear. Eine Übergangskollektion für freizeitorientierte Radsportlerinnen. Die ELEMENT Kollektion besteht aus erstklassiger Radbekleidung, die speziell für Frauen, die mittlere bis lange Strecken fahren, entwickelt wurde. Hauptmerkmale: vielseitiges Produktsortiment, modisches Design mit Rennrad- oder MTB-typischen Details, mit schlanker oder bequemer Passform, guter Sichtbarkeit und Top-Funktionalität. Das WINDSTOPPER® Active Shell Material ist leicht und einfach zu verstauen und bietet komplette Winddichtigkeit, maximale Atmungsaktivität und Wasserfestigkeit. WINDSTOPPER® Active Shell Gewebe sorgt für ein bequemes Gefühl und somit bessere Leistung im Sattel. Alle Bestandteile wurden für eine optimale Feuchtigkeitsregulierung hergestellt, um äußerste Atmungsaktivität und optimalen Komfort bei großer körperlicher Belastung zu gewährleisten. A gilet or vest, depending on your geographical location or personal linguistic preferences, is one of the most useful pieces of kit a cyclist can have...The Gore Element Lady Windstopper Active Shell Vest sits towards the upper end of the weight spectrum, but it does look great and offers long-ride comfort...Part of Gore Bike Wear's Element range, this gilet is aimed at the recreational and fitness rider rather than speed demon, and yet it translates easily for that sector of rider too...it's designed to be fully windproof and also extremely water repellent while retaining breathability...The main fabric is stretchy, as is the binding to the armholes, helping to keep the wind out. There are two side zipped pockets and reflective accents scattered mostly across the lower back...The fit is billed by Gore as slim, which means that if you're on the cusp of the stated sizes you might want to consider going up a size, but the cut is flattering and contoured, with good length in the body to suit all but the tallest or smallest of women...The fabric is extremely comfortable to wear and perfect for rides where persistent windy conditions are likely. I found it protective both from wind and even heavy showers, it didn't get sweaty and kept me a good stable temperature...Although the gilet does roll up small enough to pop into a jersey pocket, it's not the smallest and does add quite a lot of bulk...At this price, the Element vest is at the premium end for a gilet, but it is well made from a tough and durable fabric and should last well, and it gives excellent levels of comfort, so in my opinion it's a good versatile investment. Contrary to my expectations, this is a useful addition to my riding wardrobe. Gore Bike Wear Element Windstopper Active Shell Weste Frauen wurde bewertet mit 5.0 von 5 von 1. Rated 5 von 5 von city4 aus Supertoller Artikel Gut sitzende und sehr angenehme Weste. 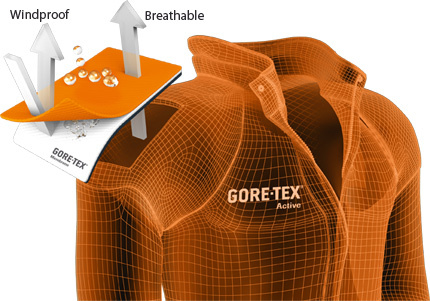 Wie eigentlich alle Artikel von Gore wear.